If you honestly thought that Disney were finished squeezing the life out of the High School Musical franchise, think again as one of the main characters gets their very own straight-to-DVD-and-TV spin-off movie; Sharpay Evans. “But I thought those crazy kids who spontaneously burst into song and dance have left high school, what’s going on?” you cry. Well, Sharpay’s Fabulous Adventure is set a year after her high school graduation to which a Broadway producer just happens to see her sing at her father’s country club and happens to be putting on a Broadway show in New York. Sharpay’s father says no at first but after seeing how much Sharpay wants to be in the show, he lets her go on the promise that if she struggles to live by herself after a month, she goes back home to her dad and works in the country club. The whole entire movie is supposed to give out a message that if you work hard enough, you’ll achieve your dreams but the message that was more visible instead was that if you had rich parents who throw their money at you and have things fall into your lap without working for it, you’ll be a star. The story relies heavily on coincidences. Sharpay performs with her dog, Boi, at the start of the movie and a Broadway producer just happens to be there. Even though she’s supposed to be showing independence, she happens to be able to afford luxurious furniture and nice things without working by spending her father’s money, which defeats the purpose of showing independence. When she gets a luxurious apartment and finds there’s no pets allowed and is kicked out, a son of Sharpay’s mother’s friend just happens to be walking along on the same street filming with a camera and happens to know there’s an apartment with nobody in it next door to him and she happens to be able to afford that too. The story would have been a lot better if it showed Sharpay getting a job and getting some money, that way, it wouldn’t show children that things would fall easily into their laps but alas, the story shows that if you’re rich and mega-spoiled, you’ll get what you want and it helps if too many coincidences happen as well. It was just shallow. Do not be fooled by this trailer, it’s quite misleading. Although the story and the plot was quite poor, the good thing that has come out of Sharpay’s Fabulous Adventure is that the acting is quite good for a straight-to-DVD movie. Ashley Tisdale, who is 25, still manages to be convincing as a teenage high-school graduate and she plays Sharpay very well as she did in the High School Musical trilogy. Austin Butler and Cameron Goodman also played their characters quite well but unfortunately, the rest of the cast weren’t as good. The movie may have good acting but unfortunately, that’s where the compliments end as most of this movie’s effort seems a little wasted as we see the writer and director make this film quite bad. It was decent enough to begin with and it was something you’d expect from a television movie that’s a spin-off to High School Musical that’s just silly fun but alas, the fun part stopped when the dogs of the movie started to become the main characters and that was when the movie just became silly. Just like the movie’s story, the characters were entirely predictable and cliché. As soon as you saw them, you knew exactly what’d happen later on in the movie and what role they played. 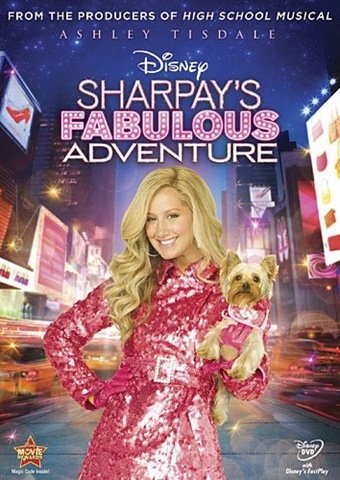 Sharpay’s Fabulous Adventure isn’t really fabulous at all and is something that shouldn’t have been made and something that kids shouldn’t really watch because of the messages it sends. Let’s be fair here, there has been worse. There has been terrible sequels and spin-offs to movies but let’s face it, this is aimed at children and young teenagers but even so, that’s no excuse for poor writing and directing. I mean, there must have been over five or six 30 second scenes where the dogs competing for the role in the musical (yes, you read that right) just stared at each other with annoying ‘lovey-dovey’ music playing in the background because they’re in love. Yes, we get it, they’re in love! We got the picture the first time, there’s no need to show us again and again and I’m sure the kids got it the first time as well. Overall, Sharpay’s Fabulous Adventure is a bad addition to the High School Musical franchise but, considering it has a character from High School Musical in it, I’m sure fans of High School Musical may like this. Parents, if you don’t want your kids to think that they need to be spoilt rotten and have rich parents to get somewhere in life, don’t let them see this movie because the true message of the movie is overlooked because of Sharpay’s personality and the story telling you that everything comes to you easily. This is a bad movie and isn’t fabulous at all, not by a long shot.